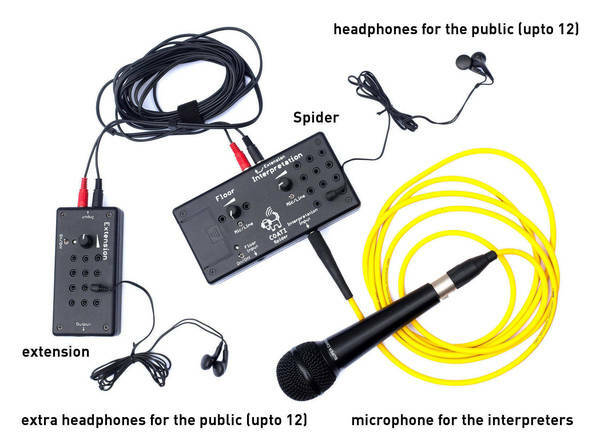 Coati develops and produces an open source version of the Spider, a small portable device for simultaneous interpretation. If you have never seen a Spider in action, read our introduction to Spiders. 12 interpretation headphones on each Spider and each extension module. Possibility to chain various extension modules from a single Spider. 2 floor headphones with a separate input. Interpreters can listen to what is being said in the room using the same Spider as the public. Each input, floor and interpretation, accept either a microphone or a line input. Uses standard jack ø 6.5 mm inputs and ø jack 3.5 mm headphones. All the headphones are joint stereo: the same audio is heard in both left and right ears. Low noise power supply using either a common 12 V DC transformer or a 9 V battery. Battery lid on top of the Spider for easier replacement. Consumption: 145 mAh with 1 extension and 12 headphones. Weight: 250 g for the spider, 150 g for the extension (without accessories). We received financial support from the Charles Léopold Mayer Foundation for the Progress of Humankind to develop this project. We were provided invaluable technical support by Befaco throughout the design process. 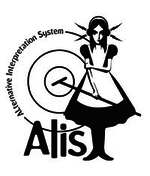 We were inspired by the Alis Spider and other previous versions.